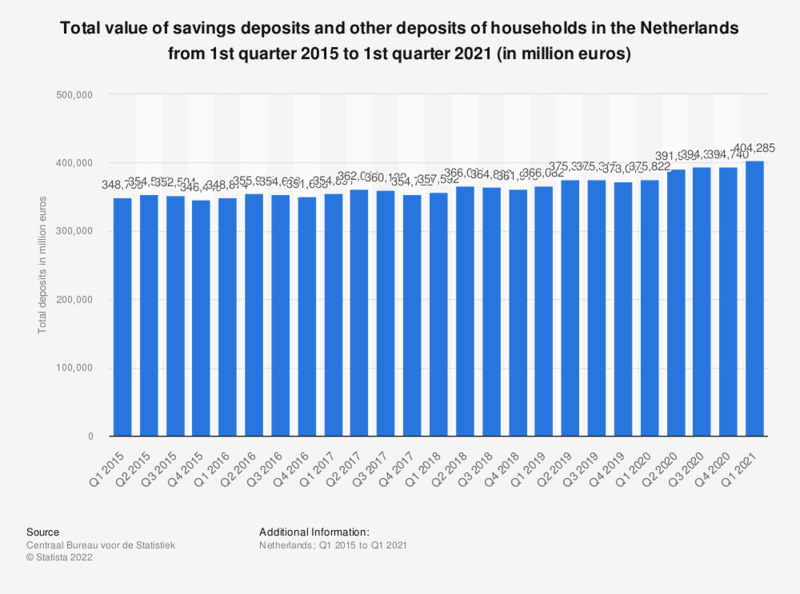 This statistic shows the total value of savings deposits and other deposits of households in the Netherlands from the first quarter of 2015 to the first quarter of 2018 (in million euros). In the first quarter of 2018, total savings were worth approximately 347.7 billion euros. This is an increase when compared to the previous quarter. According to the source: "savings deposits and other deposits are all the savings of individuals and deposits (in euros and foreign currency) at any resident and non-resident bank, which are not immediately transferable without restrictions". The source states: "the sector households includes all natural persons who are resident for more than one year in the Netherlands, irrespective of their nationality. On the other hand Dutch citizens who stay abroad for longer than one year do not belong to the Dutch sector households". The source also states it includes non-profit institutions serving households (NPISH), such as religious organizations, charity organizations, political parties, trade unions and cultural, sports and recreational organizations. * The numbers provided are provisional.